I recently re-read George Soros’ lectures at Central European University from October 2009. He gave five of them and they will be something I return to over time. 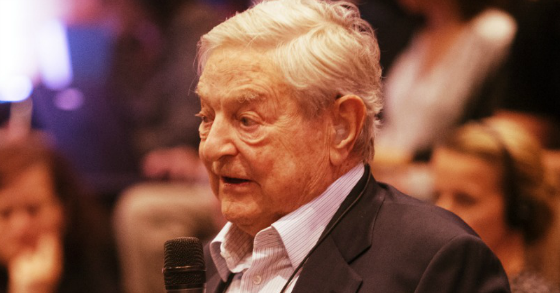 Soros’ most formative experience was as a 14-year-old in 1944 and having escaped the Nazis out of Hungary. His father saw the writing on the wall and was able to arrange for him and his family to escape, as well as others. Soros saw the devastating consequences of totalitarian systems. This, in conjunction with studying with philosopher Karl Popper in London, inspired a lifelong quest by Soros to develop a coherent philosophy to help explain how individuals and societies process the world and how important an open society is for the fostering of free expression and debate because no one has a monopoly on the truth. Soros developed his theory of reflexivity over time and this served him extraordinarily well as it was instrumental in helping him earn billions of dollars as a global macro investor during his illustrious investing career. As a point of reference in 1981, he managed $100 million, of which $40 million was his capital. Today he has an estimated net worth of over $25 billion. Soros initially believed that open societies allow for the pursuit of truth and understanding. This is because it is in such an environment that society and its members can have the highest probability of processing the world with an emphasis on the cognitive function in which knowledge and truth flow from the external world to the mind. This is only half the story, however, as humans are inherently limited in what they can process and retain and suffer from distortions and partial knowledge as well as insecurities, desires, incentives, constraints, and mental shortcuts which can lead to the manipulative function being more in control and taking charge and subordinating the cognitive function. This leads to the mind flowing to the external world and creating distortions. This can only go so far, however, as eventually, reality will be so different than what was expected that great disappointment will ensue. This does not mean, however, that great damage cannot take place up until the awakening occurs. How is this for an example of the manipulative function taking control? Apparently, enough people believed Donald Trump, along with other bold claims to have him become elected president. Or maybe they didn’t believe him and were voting against Hillary Clinton. Peter Thiel said that people took Trump literally but not seriously when it should have been the opposite. Unfortunately, when one is elected to office they have to step up to the plate and be serious and literal if they want to be effective. I digress. Trump actually had to do the messy work of spearheading legislation and not just cutting a deal. To use Trump’s words, it was a disaster how he and the Republicans handled it. Someone focused completely on the objective function (to the extent we can block out the manipulative function completely) could have easily predicted this. I did and I am no political expert. In my 30 years at CWS, I have interacted with hundreds of people. Those who have tried to influence me and those who I have tried to influence. I have come to learn to listen very carefully to what people say and how they say it. One of my favorite pieces of advice is that it’s better to be a meaningful specific than a wandering generality. When generalities are the basis of the communication at the expense of specifics my huckster antennae goes up and there is very little chance I will do business with that person, especially if they are always in selling mode. Trump never speaks in specifics and only in generalities. He is always selling or trying to persuade and details get in the way of this. 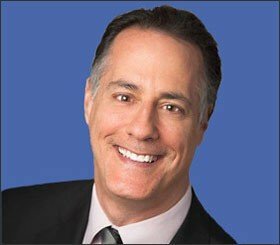 When it came to Obamacare repeal and the replacement I looked at the competing interests, the lack of any evidence that Republicans were prepared to advocate and implement versus oppose and block and the speed with which they were trying to jam an incredibly complex restructuring of one-sixth of the economy down the throats of the American people. When I come across ideological behavior that is devoid of balance and common sense I just shake my head and smile to myself knowing that money not only flows from the impatient to the patient as Warren Buffett has pointed out but from the steadfast and ideological to the flexible and objective. Soros is a great believer in reality shaping people’s thoughts and beliefs as well as the converse: people’s thoughts and beliefs shaping reality. They feed off of each other. He uses an example in his lecture that when someone says it’s raining outside that this statement can be tested whether it’s true or not. When someone says these are revolutionary times, this can’t be. But if someone truly believes that, then they can act in ways to reinforce that belief, especially if they are in a position of power or influence (e.g. Steve Bannon). If lenders believe that apartments are very good collateral to lend against because delinquencies and losses are so low, what they may not realize is that this is the case because lenders keep loaning against the collateral which pushes up demand for the investments and prices rise which translates into higher equity values and safer loans. The observer is influencing what is being observed. Bubbles form when reality initially conforms to the beliefs of the many and this then gives them more confidence to get in deeper as their initial hypothesis passes the early tests. Eventually, the vast majority is all in and then something changes to make people realize their reality is not conforming to their expectations and the great unwind begins. This is when the observation that markets go up like an escalator and drop like an elevator manifests itself. This is why I recently sold off most of my equities position in my 401(k). There was a kernel of truth that Trump would be good for business and earnings and sucked people into the market which led prices to rise and made people think they things would get better financially for them which in turn has pushed consumer confidence up and then brought more people into the market. The manipulative function then began to dominate the cognitive function since everything was banking on the come and betting on someone who had no experience running anything for which he didn’t have full control and who was surrounded by equally inexperienced people. It felt a bit like vaporware to me. This influenced the Fed to raise rates based on future expectations versus any concrete evidence that the economy had reached escape velocity. 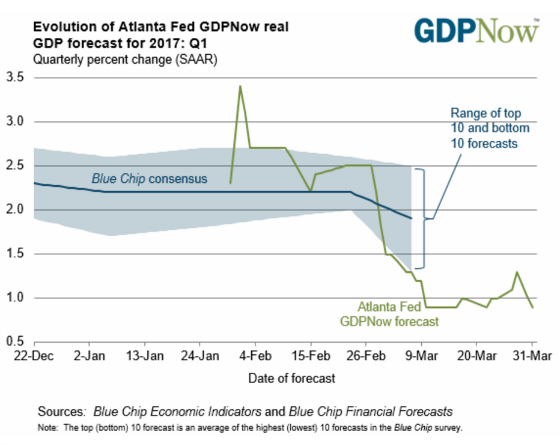 In fact, to the contrary, data has been soft as evidenced by GDP Now and the difference between soft and hard economic data. The trend in the above chart makes one wonder what the Fed is seeing that others are not. 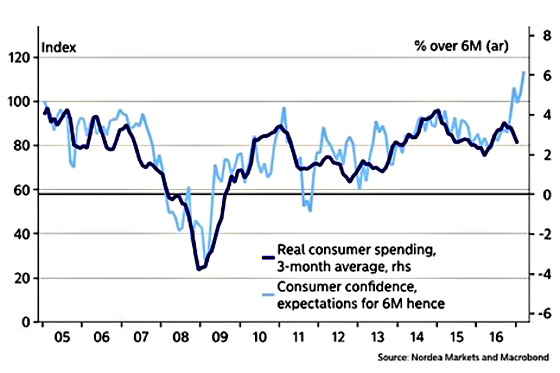 Perhaps it’s the next chart which shows the disconnect between soft, sentiment and expectations data and hard economic data. This could be a very interesting test of Soros’ reflexivity in which the observer influences what is being observed. People saw a sea change in the election of a “pro-business” president in Donald Trump versus the “anti-business socialist” Barack Obama. Animal spirits kicked in and equity prices shot up which fed into consumer confidence and then influenced the Fed’s thinking as now it could also bank on the come with unemployment below 5% and inflation reaching its 2% target (let’s not forget that this was a minimum target) and seeing escalating consumer confidence, higher stock prices, and the prospects for tax cuts, infrastructure spending, and deregulation as reasons to move rates higher to not get behind the curve. It also feeds into the narrative that we are headed in a new direction and now, finally, we can reach escape velocity and get back on track to more normal 3% growth. The Fed being on board was the last major missing piece of confirmation needed for this narrative to fall into place. No worries about ignoring some disconfirming evidence such as lower GDP estimates, a bit of a flattening yield curve, a weakening dollar, softer oil prices, deteriorating global trade, the prospect of trade frictions, a White House in complete disarray, a legislative agenda that is at great risk due to a Republican civil war brewing, no White House leadership or command of policy details, and a more confident Democratic party that sees very little to gain in working with the president. The international situation doesn’t look to sanguine to me either, just to throw another wrinkle into the narrative. On the other hand, perhaps I’m wrong and the market is right. 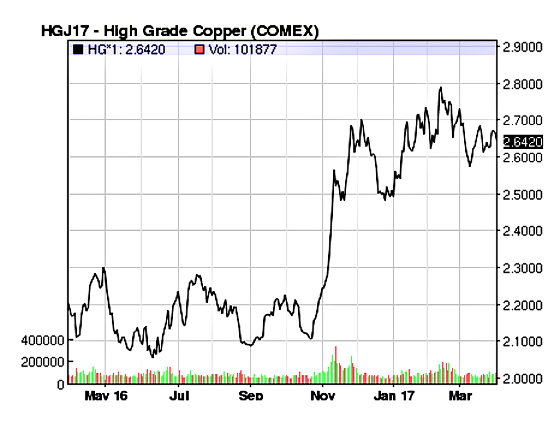 Copper prices have been known to be a good reflection of economic activity and the following chart shows they’ve held their significant gains since the election, although they are off their highs. 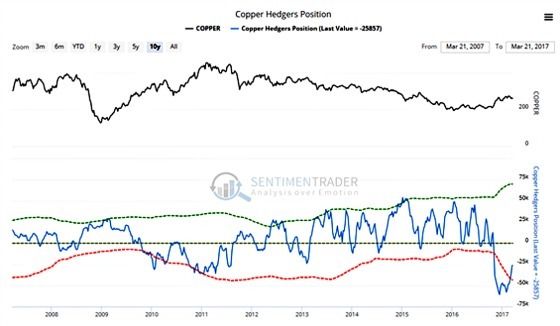 On the other hand, if we look at how the “smart money” hedgers are positioned in the futures market, one can see that they haven’t been this short for the 10 years of this chart and their normal positioning is to be long. So this leads me to question whether the manipulative function is still ahead of the cognitive function and there will be a reconciliation at some point in the medium term. All I can say is this should be a fascinating time for those who strive to be rational and objective to see how far the manipulative function plays out because it seems like it is in full force. Even if my move out of equities and into fixed income turns out to have been the wrong decision due to material underperformance, I think I will be at peace with the decision because I feel like I made the adjustment for the right reasons and without real money on the line, then it would have just been an intellectual exercise. Now I have skin in the game to monitor and test my beliefs so I can learn from the experience and help me make better decisions in the future. I am betting that the objective function will outperform the manipulative function unless the manipulative function becomes so powerful that it significantly changes the trajectory of the economy and earnings in a reflexive way. I believe the objective will defeat the manipulative function. Time will tell. Do you have skin in the game? Do you feel that the objective function will outperform the manipulative function? It certainly is a fascinating time!